Hey, Friends! Welcome to part two of our goal setting series. Last week, we kicked off the event with an exploration of the 7 key areas for setting goals in our life, and today we’re taking a deep dive into the first of those categories: career goals. Before we jump in, however, let’s talk briefly about setting S.M.A.R.T. goals. Be specific about your goal; what exactly do you want to achieve? How will you know when you achieved the goal? Thinking realistically about your situation and the resources available, is this goal achievable? Why is this goal important to you and your life? The strategy of S.M.A.R.T goals has skyrocketed in popularity over the last few years, and this is for good reason; it works! 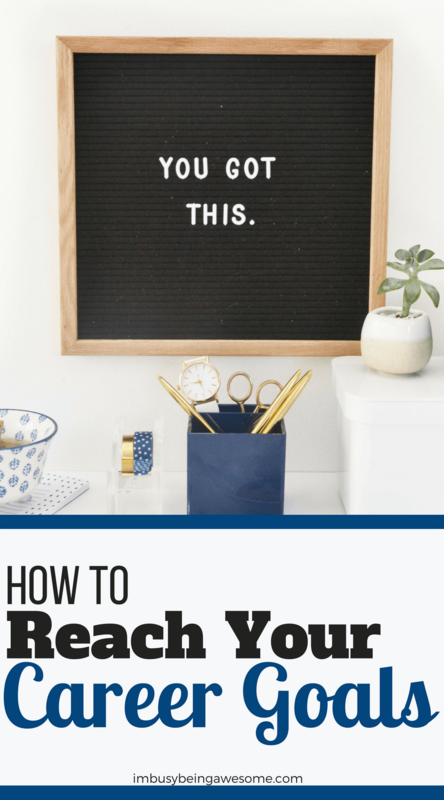 When you make specific goals that are important to you, and that contain measurable, achievable, actionable steps, you’re essentially mapping out a guide to help you get there. I will lose 20 lbs. over the next 6 months by going to the gym every Monday, Wednesday, and Friday, alternating cardio and weight lifting. I will also follow a Keto diet, and stick to 20 net carbs or less per day. I will lose 20 lbs. This is a great question. And the reason why it’s important to look at each category individually is it makes us get even more specific about our objectives. Yes, you’ll make S.M.A.R.T. goals for each category, but you’ll also use different strategies depending on your final destination. So keeping that in mind, let’s get on with the show! 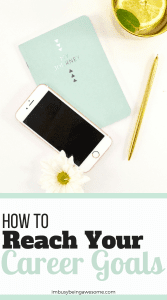 As you venture into the world of career goals, the first thing you need is a long-term plan. What is your ultimate end goal? Where do you want to end up? Do you want to become an executive producer with your own production team? Are you working toward owning a successful consulting business? Do you want to get tenure? Don’t limit yourself. Now is the time to think big and figure out where you’re going. But remember, the first two requirements for setting a S.M.A.R.T. goal are specific and measurable. So seriously – be specific. So rather than saying: I want to become a principal. You might instead state: I will become the head principal of the elementary school at which I teach by September 2022. What does a successful career mean to you? Are you working in a position that will help you reach that definition of success? Do you feel like you’re “meant” to do something? Do you have a special gift that you’re inspired to share with the world? What career would allow you to do that? If you could create the ideal job, what would it be? Who do you most admire (either inside or outside your career field)? What is it about them or their career that you find so valuable? Is this something you would also like in your career? Where do you see yourself in 5, 10, 15, and 20 years? Next up: create your short-term goals. And just as the title suggests, short-term goals are smaller goals that help you move toward your long-term goal. 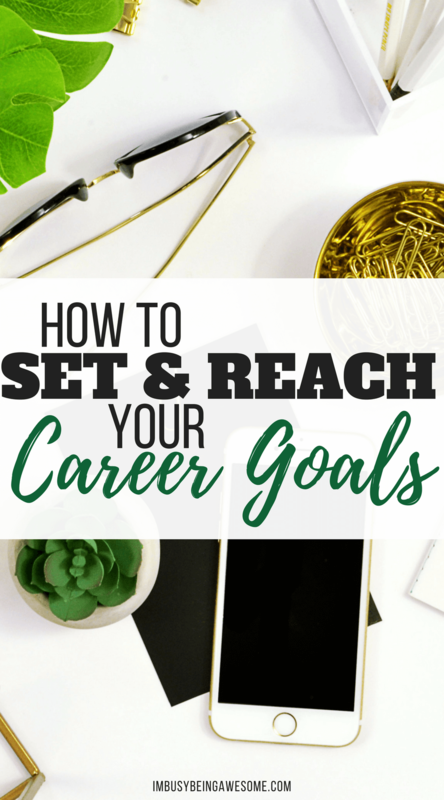 In a typical career setting, these goals might include: furthering your education/training, developing related skills, practicing those skills, gaining further experience, networking, etc. Now that you know both your long-term and short-term career goals, it’s now time to map out your career plan. When will you begin taking the required training courses? How can you practice your new skills on a regular basis? When will you talk with your boss about initiating that new project? How can you gain feedback from your peers? When will you start networking? etc. And to risk sounding like a broken record, make sure you get specific! Include specific dates, the exact school, and program, the different conferences/organizations you’ll attend etc. The more specific you are, the easier it is to simply follow your plan step-by-step toward your goal. So you understand the idea behind long and short-term career goals. And you recognize the importance of setting specific, measurable, and timely goals. But what goals should you set for yourself? Of course, setting career goals is an entirely subjective situation; each person’s list differs depending on their career, their long-term objective, their priorities etc. Nevertheless, there are a handful of broad career goals toward which many people work. So if you’re just starting out on this journey, and you’re wondering where to begin, check out these three top categories for career goals. Chances are, you’ll find something that speaks to you and your situation. Increasing one’s performance is one of the leading career goals, as many of us want to progress and improve in our respective fields. Remember, however, that just saying “increase my performance” is not nearly specific enough. So what exactly do you want to increase? Do you want to improve your client communication by answering emails between 8:00-9:30 each morning? Do you want to increase your writing output by publishing 3 articles in the next two years? By looking for specific ways to improve your performance, you’re not only challenging yourself to grow and learn, but you’re also demonstrating your value to your employer. Double win! Like increasing performance, furthering your education is another popular career goal. In fact, most careers require additional training or certification in order to move up in the field. So whether you take evening graduate courses to move from a 4th-grade teacher to vice principal, online RN MSN courses to transition from a registered nurse to a nurse practitioner, or advanced styling classes to learn the latest techniques as a hair stylist, keep this important goal in mind. Chances are, you’ll run into it a few times as you advance along your career path. This goal is a big one. You don’t need me to tell you how great it feels to get recognized – and rewarded – for your hard work. And since many of us strive to improve our skills and strengths generally, it’s only natural that we want to carry that into our careers as well. Remember, however, that getting a promotion takes a lot of planning and hard work. So step up to the plate. Take on extra projects. Go the extra mile. Track your accomplishments. Develop relationships with those both in and outside of your field. Keep your resume up-to-date. And – to risk sounding cliche – keep your eyes on the prize. Remember, this is a long-term goal, and you have to work through all the short-term goals to help you get there. But you will get there. And that wraps up part two of our Goal Setting Series. 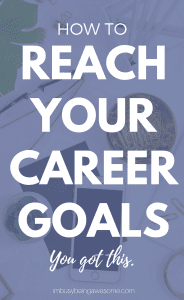 Be sure to download my free career goal workbook, which helps you highlight both your long and short terms goals, and ultimately reach your ideal career. What are your career goals? Do you practice setting long and short-term goals? 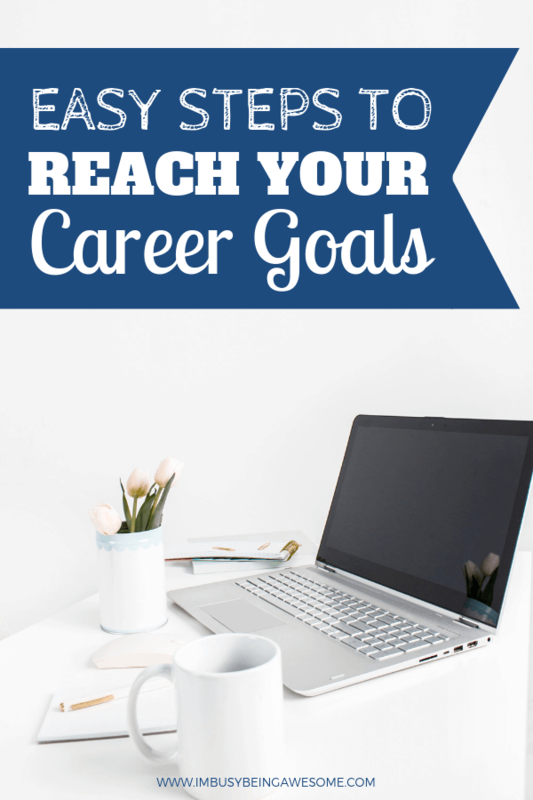 Do you face any challenges when it comes to setting career goals? Let me know below! So true!! Specific, measurable and attainable is the way to go when setting goals! This is amazing! I’ve never heard of SMART but I love the concept! SMART goals are amazing. I see a noticeable difference when I actually make myself use them! Trying to re-train myself to do it more. It’s amazing how much of a difference it makes, isn’t it? Smart method sounds amazing, I will be implementing it into my life! I feel in a bit of a tailwind these days. I love the idea of breaking up goals into more specific parts! The hubs and I did this for our home at the New Year and its made everything seem waaaaaay more realistic and approachable! I love the SMART method of setting goals. I need to get better at setting more long and short term goals for my blog.